The plan to replicate one of the country''s most successful rhino rehabilitation programme at the Dudhwa National Park in Uttar Pradesh is stuck -- for want of a sedating drug that is banned in India. The state''s forest department has now sought to obtain no-objection certificate (NOC) from the central government to acquire -- Etorphine (M99) and its antidote -- a drug banned in India and produced in some African countries, the officials said. "The drug is used to immobilise large animals like the rhino. It is required to shift some of them from their present enclosed area to the new one, and to do tests," Dudhwa National Park Director Sunil Choudhary told IANS. The plan is to rehabilitate three rhinos in an enclosed area of 14 sq.km in the Belraya Range of the forest, some 15 km from the present 24 sq.km Sonaripur Range''s enclosure where 34 rhinos thrive. Considered as an example of one of the most successful rehabilitation programmes in India, rhinos were re-introduced in Dudhwa in 1985 after the region was stripped off its last free ranging rhino by a hunting party in 1878. "The rehabilitation case of Dudhwa is one of the most successful in India. There is a need to replicate it. We have everything at place, the electric fencing is complete and the new area is ready," Dudhwa Deputy Director Mahaveer Koujalaji told IANS. Pointing towards a new only-months-old rhino-calf playing with its mother, Koujalaji says that Dudhwa has a great scope for them in near future. However, the second phase of the rhino rehabilitation in Dudhwa has been delayed for over 25 years. The Indian Wildlife Board in 1991 strongly underlined the urgency of creating another viable rhino breeding area here and identified a site for that. The department, however, needs to speed up the process and complete the logistics demanded of the programme to make up for the lost time. For this, it needs to sedate and immobilise targeted rhinos so they could be physically translocated to a new place. Unfortunately, the drug used for sedating and its antidote are banned in India and need to be procured and imported from African states, which have substantial numbers of rhinos and where translocation is often practised. Rhinos as a routine are not tranquilised since they cannot be left in that state for longer than 60 minutes. Sedating is practiced to immobilise them so during handling they do not become aggressive and attack the people around. "The NOC is sought from at least four different ministries, including agriculture and environment ministries, and the Narcotics Department. It would take next two to three months to obtain the drug," Choudhary said. 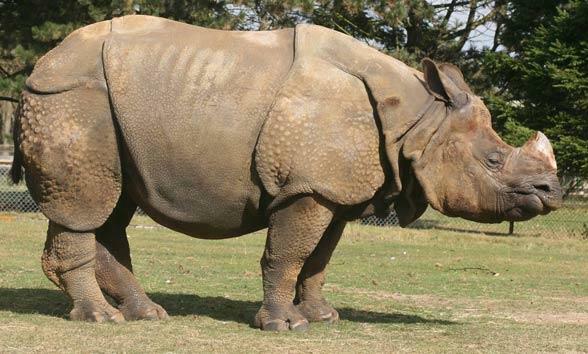 To avoid in-breeding -- which drops the immunity levels of the next generation -- a male free-ranging rhino that came wondering from Nepal and was captured, will be used. Two identified females will also be shifted. "The other option is to use one of the Dudhwa''s male rhinos named Sehdev and Raghu. We also have option to bring females from Assam, West Bengal or Nepal in future if required," Chaudhary said. He added that the rhinos will be go through some tests and their behaviour around the new area will be observed. "We had roped in experts from WWF and Kaziranga National Park. We hope to get results in a year or two," Choudhary said. Referring to another ''lost'' free-ranging rhino from Nepal, which is wondering around the periphery of Lakhimpur-Kheri district, Choudhary said, "We will try tranquilise and run some tests on that rhino as a mock drill. If required rehabilitate it in the new enclosure." A natural habitat for the rhinos with a mixture of dense Sal forests, grasslands and ponds, Dudhwa''s first batch of six rhinos was bought here from Assam in 1984. However, three of the animals died, leaving behind two males and one female. "The Indian government then got four female rhinos from Nepal in exchange of 16 elephants. The first seven rhinos here included two males from Assam, Raju and Banke," Dr V.P. Singh, a Terai region based wildlife expert, told IANS. According to Singh, Raju died in 1988 in a territorial fight with Banke. The ''grand'' father of Dudhwa''s rhinos, Banke recently died at the age of 48 in December 2016. There are around 2,768 rhinos in India, of which 2,505 are in Assam as of 2012, 229 in West Bengal as of 2013 and 34 currently in Dudhwa, Uttar Pradesh. The rhinos of Dudhwa have now entered the third generation.